In the everyday world, the amount of disorder, or entropy, in an isolated system can only increase over time. This relation is described by the second law of thermodynamics. This indicates that not all of the energy we provide for a system can be converted into engineered work. In quantum physics, however, the existence of such a law is obscure. One of the main reasons is that entanglement can dramatically alter the notions of disorder and equilibrium state. 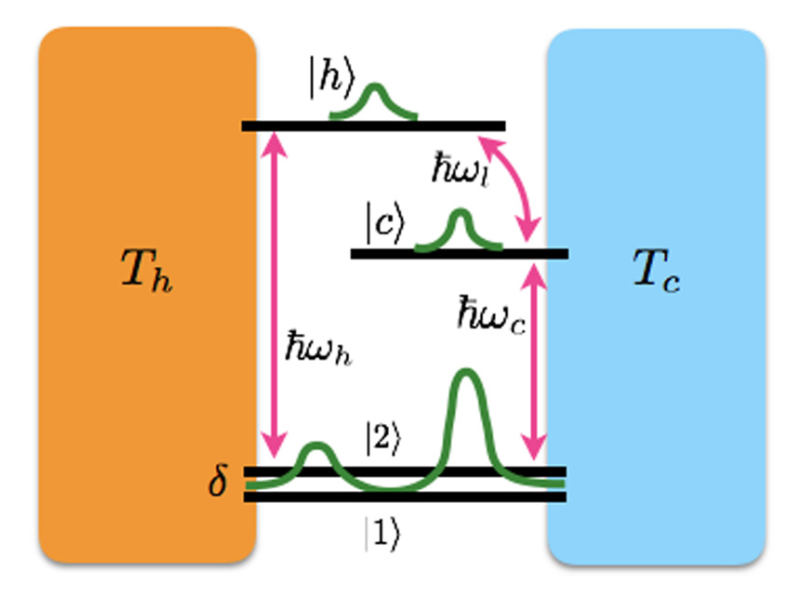 Instead of an analogue law, recently a correspondence has been found between entropy production and the statistics of energy transfers in a quantum system. In my paper published recently at Physical Rev. B I studied how entropy is produced in a quantum heat engine. This helps us to explain how heat is dissipated in the engine. The engine is modelled by four electronic levels resonantly-coupled to thermal heat baths kept at different temperatures. 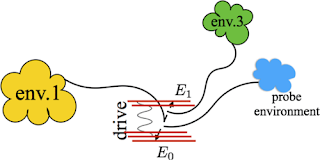 Results show that quantum coherence that is induced by environment can significantly and nonlinearly modify entropy production in the cells. Consequently, the nonlinear entropy production can take place much slower or faster. This determines under what conditions information in these cells can take a reversal flow from a cold to hot bath. I evaluate entropy production in a photovoltaic cell that is modeled by four electronic levels resonantly coupled to thermally populated field modes at different temperatures. We use a formalism recently proposed, the so-called multiple parallel worlds, to consistently address the nonlinearity of entropy in terms of density matrix. 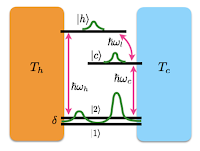 Our result shows that entropy production is the difference between two flows: a semiclassical flow that linearly depends on occupational probabilities, and another flow that depends nonlinearly on quantum coherence and has no semiclassical analog. We show that entropy production in the cells depends on environmentally induced decoherence time and energy detuning. We characterize regimes where reversal flow of information takes place from a cold to hot bath. Interestingly, we identify a lower bound on entropy production, which sets limitations on the statistics of dissipated heat in the cells.